It’s hard to believe that I’ve been out of college for almost as long as I was in it. A lot has changed since graduation. I continue to grow as a person and my career continues to transform but one constant remains: The friends I made at Colorado State University are still by my side. I met Katie Williams during our sophomore year of college when she applied to be one of my caregivers. Not long after she began working for me, our friendship blossomed. Now that we have both left the comforts of our alma mater, our lives have taken us on different journeys. Katie works as a social worker for a mental health nonprofit in Denver, and I travel the country speaking on behalf of MDA. 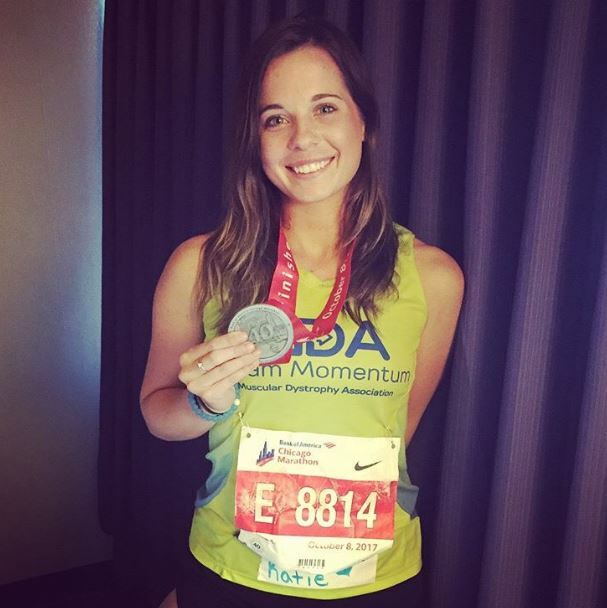 Over the summer though, much to my delight, Katie joined the ranks of MDA, signing up to run the Chicago Marathon with MDA Team Momentum. I was so excited when I heard the news. Offering to help her fundraise, Katie and I decided that we would color our hair blue on race day if she met her fundraising goal. I’m happy to report that she not only met her goal, she surpassed it! 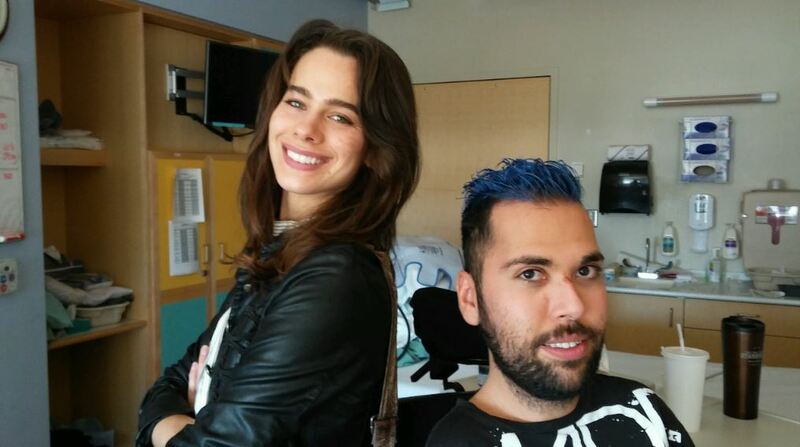 And on Oct. 8, in a hospital room in Colorado (unfortunately I had pneumonia on race day), I colored my hair blue in solidarity with her as she took on one of the most well-known races in the country. A few days after her race, I called Katie to hear all about how it went. Though I wasn’t able to be there to watch her run in person, I was so excited for Katie to take on this challenge. In my time as MDA National Ambassador I have watched how Team Momentum impacts so many people. I’m so glad Katie got to experience it for herself. JA: How did you get involved with TM? KW: I’ve been running since I was 17. Last May, I did the Colfax Marathon in Denver. At the Expo, I noticed MDA had a tent up. Knowing how involved you (Joe) were with them, I figured I’d go say hi and see if anyone knew you. Everyone I met was so nice, and we chatted about how we all knew you. They asked me if I had ever thought about running for MDA and I told him I hadn’t because I didn’t know they had an endurance program. I went ahead and signed up for their email updates and about a week later I got an email asking if I wanted to join the team for the Chicago Marathon. I’ve always wanted to do a destination race and I figured this was a great way to get involved with an awesome organization. I’ve been wanting to do more for others and thought this might be an awesome way to do so. JA: Were you nervous about meeting your fundraising goal? KW: This was really my first experience with raising money for a cause. I don’t think I knew how hard it could be. I kind of thought it would be no big deal and I could just post on social media, but it’s more complicated than that. At first I got some donations, but by August I still needed about $1,000. I reached out to my Team Momentum Endurance Manager and got some great fundraising ideas. Next time, though, I’ll definitely plan ahead for fundraising. JA: What did you think of the Inspiration Dinner the night before the race? KW: It was awesome. It was great to get to meet everyone who was running and it really helped to build a bond between us. Just being able to hear everyone’s stories for why they were running was really powerful. Some of them were sad, some of them were happy, but they were all powerful. By the end of the night I felt like I know everybody and we were all there to support each other. JA: How was the race? KW: It was awesome, but hard. For me, I think the first half of the race went really well but I didn’t realize how fast I started. Around mile 15 I started to hit a wall. I definitely should’ve paced myself better. But what kept me going was my team and my accountability to the people who donated to see me run this race. I kept thinking to myself that I was running because so many people can’t, and a lot of them would probably give anything to be able to run 26.2 miles. When I started to wear down, I texted my TM coach and she really helped motivate me through the finish line. It didn’t matter that I had to take breaks; all that mattered was that I did it. And everyone cheering on the side of the road made it all worth it. It was awesome after I had finished to watch others on my team finish, too. It was such an empowering feeling and event. It’s something I’ll never forget. 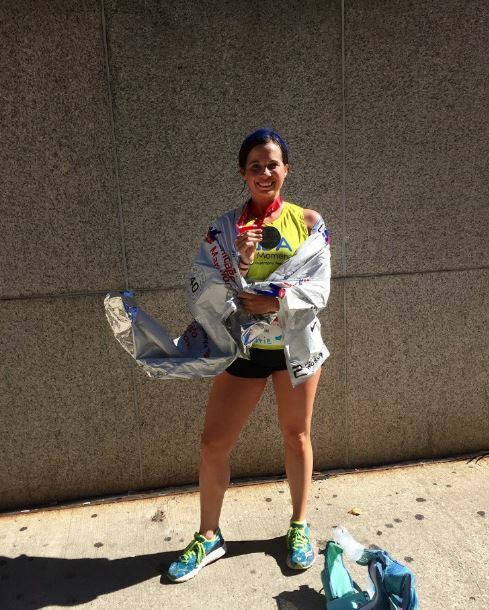 Congratulations to Katie for setting a personal record of 3:57:49! We are all so proud of her!